Most of the diamonds transacted in conventional diamond trade are not certified. The few diamonds that are certified by reputed testing labs, command premium prices. So while buyers feel more confident buying diamonds that have been certified, they need to pay a higher price for certified diamonds. DiaEx is poised to bring a positive change in the way the $90 billion industry has operated for decades. DiaEx the diamond trading platform based on the latest blockchain technology, insists on a certification for all listed diamonds. It would therefore be logical to expect that, diamond prices on the DiaEx platform would be higher than what the general market offers. However a better understanding of the DiaEx exchange will prove that, reality is just the opposite. Before we get into the details of this exchange, here is a very quick roundup of how conventional trade in diamonds is handled. Sellers intending to sell their diamonds, release the precious stones through a chain of middlemen (brokers). Depending on the value of the diamond(s) involved and their physical location, these diamonds pass through one or more brokers. The important thing is that, it is only the first broker who is aware of the exact price quoted by the seller. Each broker adds his share of commission and releases the diamonds to the next broker. The final buyer pays a price that, is the total of the sellers quote + all the commissions gathered along the way. The buyer has no idea of the original price quoted by the seller and ends up paying more without, getting any additional value or benefit in return. A business analyst would sum up the entire process as, price cloaking and price inflation. Now taking up the issue of certified diamonds, here is what the term means. A diamond certification process is performed by independent diamond testing labs. The certificate would ideally contain at least the following information, the authenticity of the diamond (synthetic or natural), the precise dimensions and weight of the piece. The often heard of 4C parameters of a diamond are critical to the value and pricing of the stone. Certified diamonds will have the Color, Cut, Clarity and Carat (weight) of the specified diamond being certified clearly mentioned on the certificate. Additional information on the diamond certificate could include, details about the treatment (if any) applied to the stone. Diamond labs sometimes provide an optional process where, the 4C values of the diamond or the lab test report reference, are etched on the girdle of the stone. The etching is extremely microscopic and is only visible by using professional magnification tools. While diamond certification sounds desirable, most of the diamonds that are conventionally traded are not certified. Certified diamonds carry a premium price but, buying an uncertified diamond can involve a degree of risk. We might mention here, that of the hundreds of labs that offer diamond testing services, only a handful (5 to 6) are globally recognized. Listing a diamond on the DiaEx trading platform, requires the stone to be certified from one of these reputed labs. Since DiaEx limits listings to certified diamonds, would these stones carry a price that is much higher than what the general market could offer? The answer is a big ‘NO’ and there are some strong reasons for this. To begin with, buyers get to choose from a wide range of diamonds listed on the platform – different sellers, different diamond grades and different prices. Diamonds that are listed at a price that is beyond the general range, would be unattractive to buyers. Trading on the DiaEx diamond exchange is conducted by buyers and sellers interacting with the platform, no middlemen, no price cloaking and no price inflation. This in itself takes a chunk off the price tag, remember that conventionally sold diamonds are loaded with a generous share of broker fees and commissions. 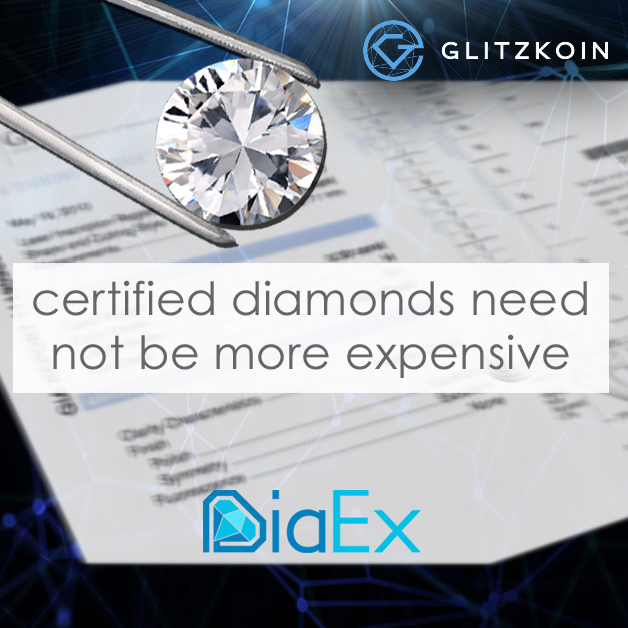 The realistic price scenario that the DiaEx platform presents, more than makes up for the added cost of getting the diamond certified. The DiaEx platform has been designed to accomplish much more than to offer diamonds at a realistic price. Buyers and sellers can trade on the platform with confidence – synthetics and fakes are kept out of the exchange. When it comes to concluding a transaction and settling payment, buyers need not put up with lengthy and expensive banking procedures. The GTN crypto token is used to settle payments on the DiaEx diamond exchange. This reduces the cost of transferring a payment, it also eliminates the challenges that multiple currencies and their conversion can bring.